The overwhelming number of Socialist Realist monuments in Albania are constructed from either concrete or bronze. However, there are occasional variations from this norm and there are a few mosaics (though not on the massive scale of ‘The Albanians’ on the National History Museum in Tirana) including those in Llogara National Park and at the Durrës War Memorial. This change of medium offers greater opportunities to the artists. Concrete and bronze are ideal for giving an impression of solidity, steadfastness and dignity. Mosaic offers the opportunity of presenting movement, human expression and a dynamic not easily depicted in the more ‘solid’ art forms. Also, importantly, mosaics provide an infinite variety of colour, the limit being imposed by the imagination of the artists involved. What is depicted at the Durrës War Memorial is the entry of the National Liberation Army into the city on 14th November 1944, just three days before the official liberation of the country on the 17th. As was not uncommon in the production of the monuments throughout the country the mosaic in Durrës was a collaborative work of three artists. We know their initials as they are represented in stone in the bottom left hand corner of the work – together with the date of completion, 1976. The problem is that finding out some of the most basic information about these exceptional works of art is sometimes equivalent to getting blood from a stone. One of them is Nikolet Vasia (the NV). He came from Durrës, worked during the Socialist period in the city’s Archaeological Museum and was known to have worked in mosaics. Unfortunately, as with a number of other ‘artists’ from the period his level of commitment to Socialism was limited, to say the least, and given the opportunity after the chaos of the 1990s gave the weak excuse of ‘only obeying orders’ and until his death in 2011 just produced individualistic and banal pieces of work. He didn’t even seem to have any pride in this wonderful mosaic. The other artist is Gavril Priftuli. He was born in the province of Korçe but moved to Durrës when very young. He also worked in the Archaeological Museum – it seems that in the city this was the way that artists earned their living, doing something for the community. However, when things changed he moved quickly and opened the first private gallery in Durrës in 1993. Nikolet Vasia and Gavril Priftuli worked together on some of the works in the Skanderbeg Museum in Kruja. F SH I have still to identify. The architect for the complex was Kristo Sitiris (1870-1853). Building began in 1947 and was, therefore, one of the first in the country. It is also unique in that it is the only Martyrs’ Cemetery in Albania to use the niches rather than tombs. Those commemorated were both those who died in combat and also those who died in Nazi concentration camps outside of the country. 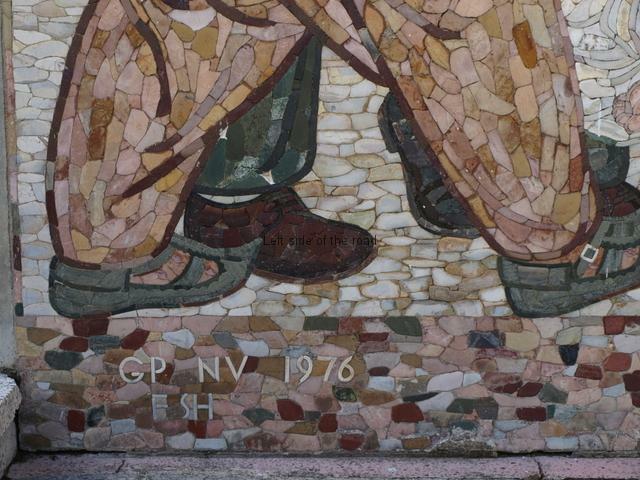 As the mosaic dates from 1976 this means that it was a decision of the Albanian Cultural Revolution to embellish the site with the magnificent mosaic. One slightly strange aspect of this mosaic is that it is ‘signed’ – even though with initials. Names, or indications of the actual artists of the lapidar, didn’t really start to become common until the later creations in the 1980s, especially after the death of Enver Hoxha in 1985. The official name of the art work is ‘The Liberation of Durrës’ and measures 5.3 x 3.2 metres. It depicts a group of eight Communist Partisans entering the city on 14th November 1944. Behind the lead male is another man, moustachioed, with the barrel of his rifle peeking up over his left shoulder. He holds the flag that was to become the national banner of the country between 1944 and 1990, the double-headed black eagle with a gold star over the two heads, all on a bright red background. To his left is a female partisan, a rifle over her right shoulder, a bandolier over the same shoulder and a pistol, in its holster, attached to a lanyard around her neck. This would normally denote an officer in capitalist armies and I think (although perhaps not the best of ideas to emulate from the enemy) this was also the case in the NLA – it takes time to ditch the old as you attempt to build the new. If that’s the case it’s worth while mentioning that women held senior positions in the Partisan Army, where promotion depended upon merit and not class background. Behind her is another male who looks like he’s carrying a heavy machine gun on his right shoulder. All these Partisans are in uniform, although there are various colours. Two of the other males in this group have whitish uniforms, on has a moustache. The other one has his light machine gun in his right hand and it’s pointing up in the air. I doubt whether he would have been firing but it’s the image we now see often when different armies or groups of soldiers enter a location in victory. There’s another unusual, and almost impossible to depict in concrete or bronze, aspect with this male and that is it looks like he has a bandage around his forehead, with a bloody spot over his left eye. In war many die, even more are wounded. Behind these two there’s the seventh of the group, of whom we only see the head. This is of a female partisan with long black hair. And she’s smiling. In fact all the Partisans are smiling, as are all of the civilians. 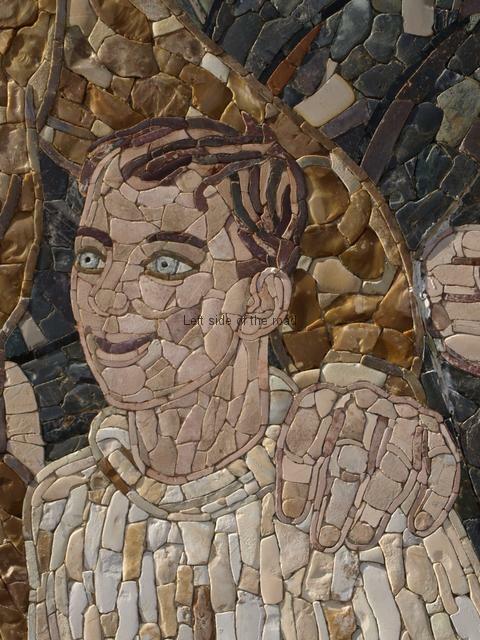 Again this is something it’s possible to depict in a mosaic which, in a sense, makes the image more ‘human’. Emotions can be depicted with the varying use of colour. The last of the Partisans is at the right hand edge of the mosaic. Over his left shoulder he has his rifle, the barrel pointing down and he has his right fist clenched in the revolutionary salute (something we saw a lot of on the Peze War Memorial) and his mouth is open as if he is shouting or calling out. His uniform is cream coloured and his bandana is of a deep red, similar to the colour of the flag. 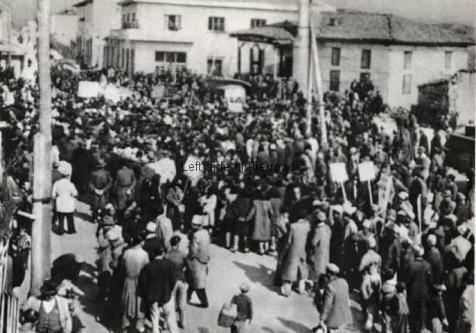 So the scene is of Partisans who are happy that the fighting is all but over and the people of Durrës are happy that they are no longer occupied by foreign Fascist forces. We have to remember that it was in Durrës, among other Albanian port cities, that the Italian forces landed in April 1939. At that time the self-proclaimed ‘King’ Zog ran away to Britain and a small group of patriots, led by Kujo Ulqinaku (whose statue is close to the seafront) attempted to delay the invasion for as long as possible and lost his life in the process. The lead male has his left hand on the shoulder of a young boy. What is interesting here is the colour of his eyes. When discussing other monuments I have mentioned how the all-Albania aspect of the liberation struggle is shown through the traditional clothing of those depicted. During my travels around Albania I have been surprised by the number of people, both male and female, who have such astonishing grey-blue eyes, a much greater incidence I have seen in any other country I might have visited. For a country with such a small population this is obviously a not inconsiderable genetic trait. This young boy doesn’t look as if he has arrived with the Partisans, his dress is more civilian than military, but in his right hand, his arm hanging down, he carries a rifle – presumably taking the load off one of the victorious soldiers but also a reference that under Socialism, for success to be achieved, the fighters of the past have to pass the same consciousness of struggle on to future generations. The failure of Socialist societies in doing that having led to the disintegration of the glorious revolutionary successes of the 20th century. The only civilian on the right hand of the picture is an older man, moustachioed, who is giving, and receiving, a double-handed hand shake with one of the soldiers. On the left of the mosaic we have a collection of Durrës citizens. From the extreme left we have a couple of musicians. The one in the front is in traditional Albanian dress, wearing a somewhat battered fez and sports a moustache. He is banging a lodra – a double-headed drum – with a thin drum stick, one skin of the drum facing us. Behind him is a younger man playing a surlja (an early type of clarinet) with the bell pointed up to the sky. The music creating a festive atmosphere to the proceedings. The remaining people represented are what could well be a family. There’s an older man, balding, waving his cap in the air and next to the lead male partisan an older woman wearing the traditional headscarf and clothing. Then there’s a younger couple and three children, a teenager and (possibly) a younger sister (also dressed in traditional clothes) and a bare footed very young boy – the last two running towards the parade. In her hands the younger woman holds a bunch of flowers. Here we have the sort of people, working class and peasantry, that would have to try to make something long-lasting of the victory gained by the Partisans. The gaining of liberty and the taking of State Power is only the beginning. It’s only then that the real struggle, the real challenge, the real problems have to be faced and overcome. There’s a lot going on in this mosaic, a lot of movement and a lot of questions being asked. This is the principal monument in a Martyrs’ Cemetery so there’s an obvious connection between the living and the dead. Those who fell in the war are martyrs but it’s up to those still alive (and those yet to come) to decide if what they died for had meaning or not. It’s well worth have a really close look at this mosaic. As yet I haven’t had the same opportunity to study the other mosaic monuments but from a cursory glance they seem to be made from multiple pieces of ceramic. The Durrës mosaic seems to be based more on the natural stone, with here and there pieces of terracotta, than classic ceramic tiles. These stones, which look at times like pieces of marble and pebbles from the beach, have been chosen for their size, colour and shape. The task of putting this together was immense but that of actually finding the right stones in the first place must have been greater. I’m sure the individual pieces had been chipped away to fit and this process can best be seen with the construction of the bunch of flowers. 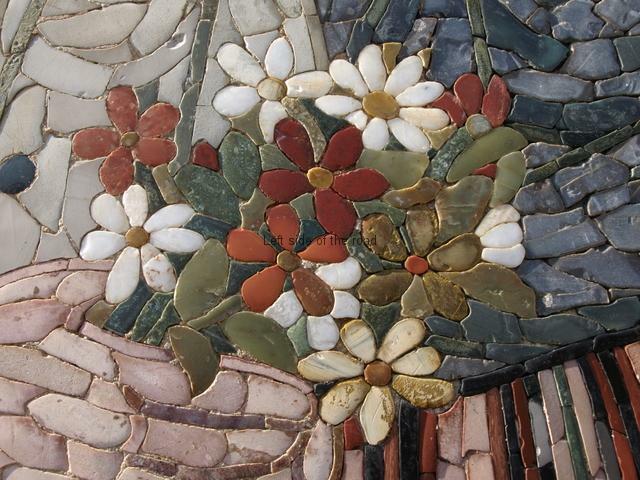 In general the mosaic is in a good condition. The only sign of damage on my last visit in November 2014 was in the top left hand corner of the People’s Flag, where a handful of stones have fallen and there’s been a somewhat ham-fisted attempt to prevent the situation getting any worse. In the small amount I’ve been able to read about Nikolet Vasia there has been no mention of this monumental (in more ways than one) piece of art. Why not when it’s a masterpiece is a mystery to me. At least it hasn’t undergone any State sponsored vandalism as has the mosaic in Skanderbeg Square in Tirana. Unlike most Martyrs’ Cemeteries throughout the country there are no graves here, rather there are niches in the wall of the curved colonnade, up the steps from the mosaic. There’s a small platform which looks out over the gardens and would be the place where official commemorative events would have taken place. Above the colonnade is a stylised flag tied to rifle with bayonet attached. 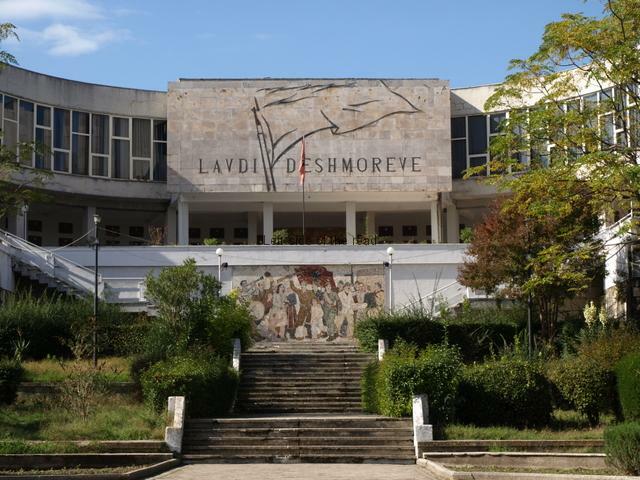 In large letters are the two words Lavdi Dëshmorëve – Glory to the Martyrs. The letters and the decoration are made of metal. Lavdi të përjetëshme dëshmorëve tanë të rënë në fushën e nderit për çlirimin e atdheut tonë të dashur. Eternal glory to our martyrs who fell on the field of honour for the liberation of our beloved motherland. Followed by a list of names. The first is Kozma Nushi – Hero I Popullit (People’s Hero), a cadre of the Albanian Communist Party and one of the organizers of the National Anti-Fascist Front in 1942. All these anti-fascist fighters would have been captured and then transported to the concentration camp of Mathausen, in Austria, never to return. Mathausen camp was for political prisoners, a slave camp, with the philosophy of extermination through labour. It existed from 1938 till the end of the war. 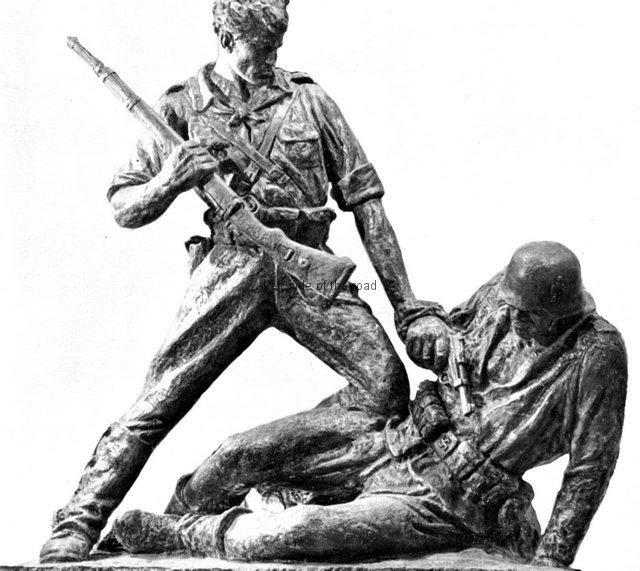 At the camp nowadays there’s a statue by Odhise Paskali (the Albanian sculptor), Monument to the Victorious Partisan (1968), which depicts a defeated Nazi soldier on the ground with a partisan about to disarm him of his Walther P-38 pistol. A copy of this sculpture is in the Armament Museum in Gjirokastra Castle. and then a list of names. These partisans would have been transported to another concentration camp. Zemun was originally a concentration and extermination camp in Croatia, on the outskirts of Belgrade. After 1942 it became a camp for captured partisans and members of resistance units from different parts of Europe. The niches in the wall are faced in marble, the name of the deceased and (often) a picture of them some short time before their deaths as well as the year of birth and death. The Communists are indicated by a star on their caps in the photo. The rooms above the colonnade used to house the local museum. This was either looted or just destroyed during the counter-revolution of 1990. Whatever its fate there’s no longer a museum to the anti-fascist war in the city. During its heyday veterans used to give presentations to young school children in the museum’s lecture hall. 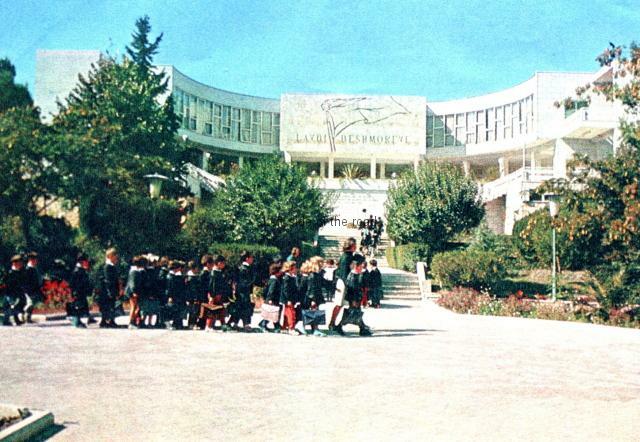 The sign at the top of the stairs on the left hand side of the building indicating that this is now the location of ‘The British Children’s Library of Durrës’ but I never saw any children in the vicinity. The sign also looks like it had seen better days, fading as is the island at the western edge of Europe. This library was originally ‘Dedicated to the memory of Diana, Princess of Wales’. The placing of such symbols of imperialism in once Communist museums, cemeteries and public spaces is similar to the idea of the ‘extirpation of idolatry’ perpetrated by the Catholic Church during the invasion of South America. When I first visited the site in 2011 the plants were allowed to droop over the edge of the platform and they were starting to obscure part of the mosaic. This has now been cut back and the gardens themselves now seem to be regularly maintained and are a pleasant oasis of calm, away from the noise of the traffic along one of the main streets of the city. This is simplicity itself. If you arrive in Durrës by either bus or (now the sadly neglected and infrequent) train you just come out to the main road and continue in the direction of travel you had been following before setting foot in the city, going roughly west. It’s about 800m from the bus/train station.